Today was chicken-washing day. The State Fair open poultry show is this weekend, so I had to get the birds cleaned up (might need some spot cleaning by Friday!). I'm only taking 3 birds, so this doesn't even compare to the winter shows where I sometimes have to wash 20-30 birds. And of course that time of year I can't just toss them out into the yard to dry! Do they like being washed? 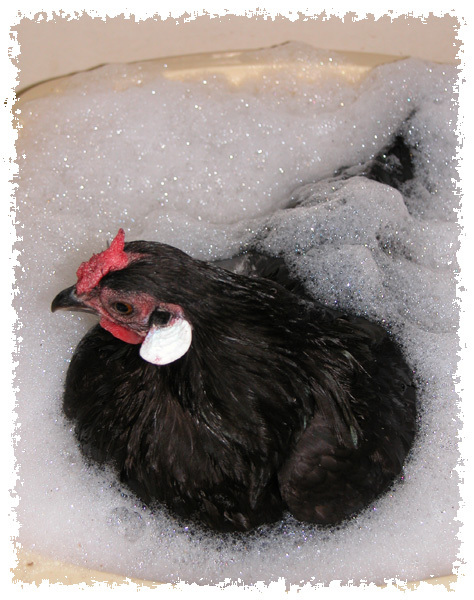 Not really, chickens aren't exactly water-fowl. They do get used to it though, and after a while they don't seem to mind. Every now and then I even see one that seems to enjoy the warm water (eyes closed, "ahhhh"). Especially when washing hydrophobic youngsters, I think I often end up soggier than they do! It's going to be a really pathetically small show this weekend. I suppose that means a better chance of winning, though I'd be pretty surprised. It's hard to have a bird in good condition this time of year, since this is when they molt (lose their feathers and then regrow them). The three hens I am taking are in pretty ragged condition, though they don't look all that bad from the outside of the cage! The "real" shows don't start til October. I'm looking forward to them!